In this, Part 1 of Birding Northern India, we travel north-easterly from Delhi into the Himalayan foothill state of Uttarakhand searching for a range of exciting birds of the region. We spend quality time in the world-famous Corbett National Park, then explore a variety of habitats in the Corbett buffer zone & picturesque Koshi river valley. From these fabulous bird & mammal-rich venues we climb even higher, birding the forested higlands of the foothills. Throughout our travels we are interested in tracking down the special range-restricted species which inhabit the narrow ribbon of terrain running west to east tracing the Himalayan foothills. Noteworthy highlights include a range of vultures & owls, sightings of the endangered Hodgson's bushchat & the tiny collared falconet, memorable encounters with ibisbills, blue-throated & great barbets, black eagle, lammergeier & numerous large mammals of the region. 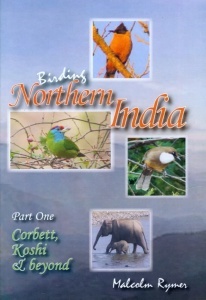 The birding & wildlife adventures continue in the companion film - Birding Northern India...Part 2 'Foothills to Rajasthan'. This DVD, filmed & edited using the latest digital technology, features over a hundred species of resident & migratory birds of the region.